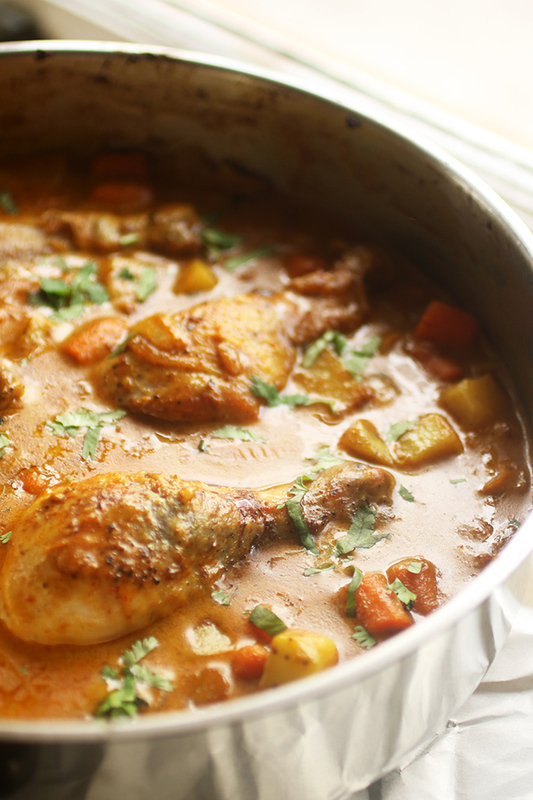 This simple, one pot chicken curry recipe is perfect for busy weeknights! 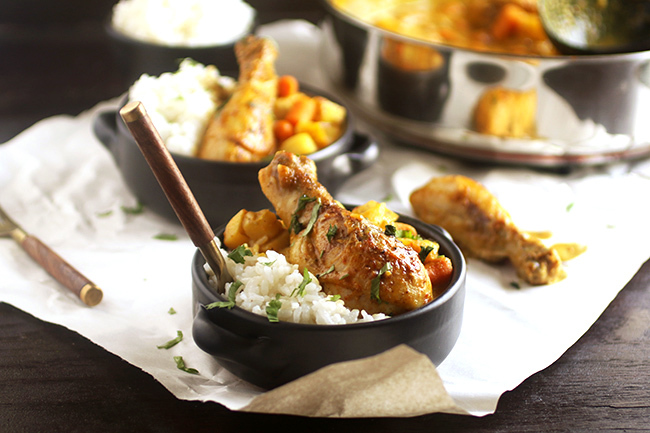 In a simple coconut curry sauce – great over rice or pasta. This post contains affiliate links, which means if you buy something I’ll earn a small commission at no additional cost to you. Thanks for supporting Life As A Strawberry! I dare you not to faceplant directly into this saucy, coconut-y, curry-y, chicken-y, potato-y goodness. Somewhere in the last few decades, my taste buds flipped a switch and decided to go into full-on can’t-stop-won’t-stop curry mode. And while my ultra-Americanized curry experience might be less-than-authentic, this easy chicken curry is definitely more-than-delicious. 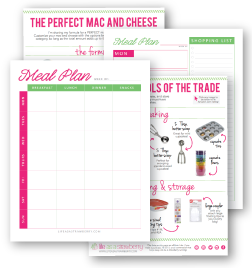 This has become one of my favorite easy weeknight go-to meals. It’s ready in less than an hour, has VEGETABLES (wahoo!) in it, and is the perfect hearty, warm comfort food after a long day. (Did I mention the vegetables? #HealthFood, even though it’s really just carrots and potatoes). Plus, ummmm, leftovers. They’re amazing. Mix it up by adding any vegetables (zucchini! peas!) you have on hand, use your favorite cut of chicken (or forego the chicken for a tasty vegetarian version), and serve with a scoop of fluffy jasmine rice for top-notch results. 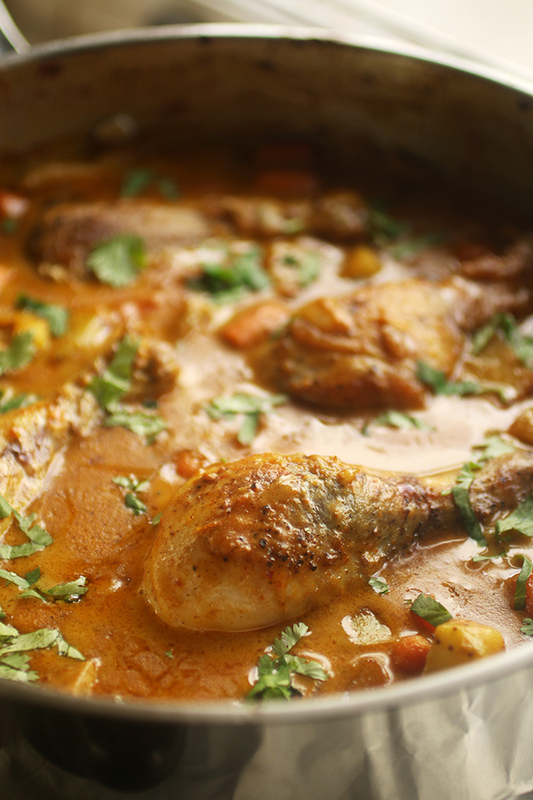 A simple chicken curry recipe – full of flavor and perfect for busy weeknights! Season chicken on all sides with salt and pepper to taste. Add chicken to hot oil and sear 3-5 minutes on each side to form a golden brown crust and lock in flavor. Be careful using hot oil to sear the chicken – it can spatter, so keep an eye on it! When chicken is seared on all sides, remove to a plate and return the pan to the stove. Don’t worry that the chicken isn’t cooked the whole way through yet! Add onion, garlic, potatoes, and carrots to skillet and saute 7-10 minutes until onion is translucent and potatoes have started to crisp up. Add another drizzle of olive oil if the pan is looking dry. Stir curry paste, curry powder, cinnamon, and cumin into potato mixture. Add coconut milk to pan and stir to combine. Add another dash of salt and pepper to taste and remove pan from heat. Return chicken to pan, nestling it into the curry mixture. 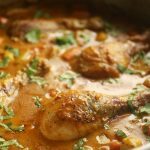 It’s ok if the curry doesn’t completely cover the chicken – just spoon some of the curry on top of the chicken pieces to keep it moist! Put the chicken curry pan into your 400 degree oven for 15-20 minutes until chicken has cooked through. Top with chopped cilantro for garnish and serve with a scoop of rice (optional). I like my curry spicy – if you like a milder flavor, cut back on the curry paste and curry powder. The amount of chicken called for is enough to give each person 1-2 drumsticks. Feel free to increase the amount of chicken depending on your family’s preferences! This recipe is also great with chicken thighs, breasts, or with extra veggies in place of the chicken for a vegetarian option. Kyle recommends drizzling a little bit of honey on top of your curry for a hint of sweetness (#KyleApproved). 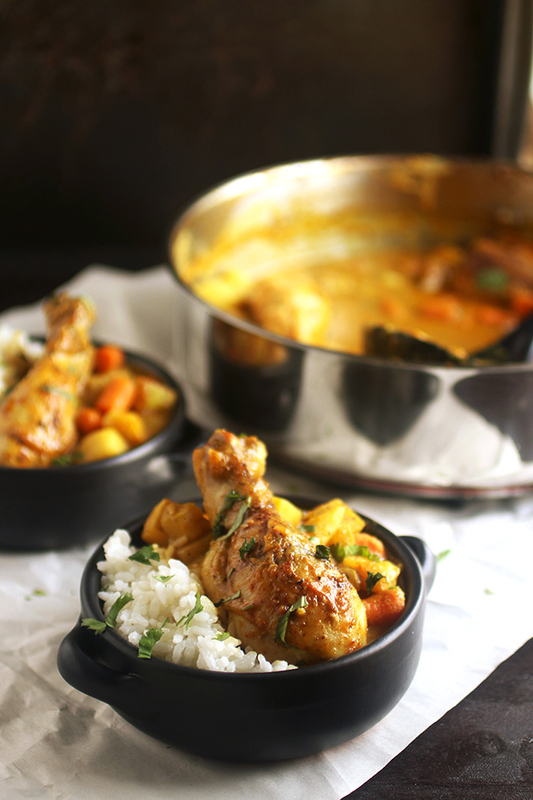 Love this.. it is my go to recipe when I want a simple but rich curry. Should it be covered or uncovered in the oven? It’s a spice-based mixture available at most grocery stores. You can also find it online here. Hope that helps! 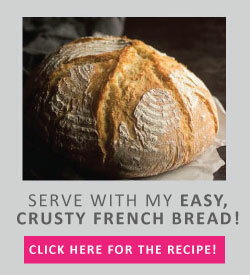 the recipe looks utterly delicious! I was just wondering: Doesn’t the chicken skin get all rubbery and chewy and fatty because it sits in the sauce for so long? Thanks, Sarah! Because I sear the chicken first and don’t bake it in the sauce for too long (only 15 or so minutes), I haven’t really had the skin turn rubbery on me. The chicken tends to be taller than the sauce during baking, as well, so the skin on top crisps up a bit during baking. To be fair, I’m definitely not what you would call a “crispy chicken skin connoisseur,” so my tastes may just be personal preference. If you’re worried about the skin being chewy, I’d recommend using a skinless cut of chicken instead of the drumsticks! Boneless, skinless chicken thighs are good in this recipe, as is a plain ol’ skinless chicken breast. I hope that helps! I never thought of honey on curry – will have to try it! Did I miss the survey drawing? I was trying to watch for it but had family in town! We’ve been loving the honey addition lately! And I JUST sent out emails about the survey drawing – time kind of got away from me for awhile there, yikes!